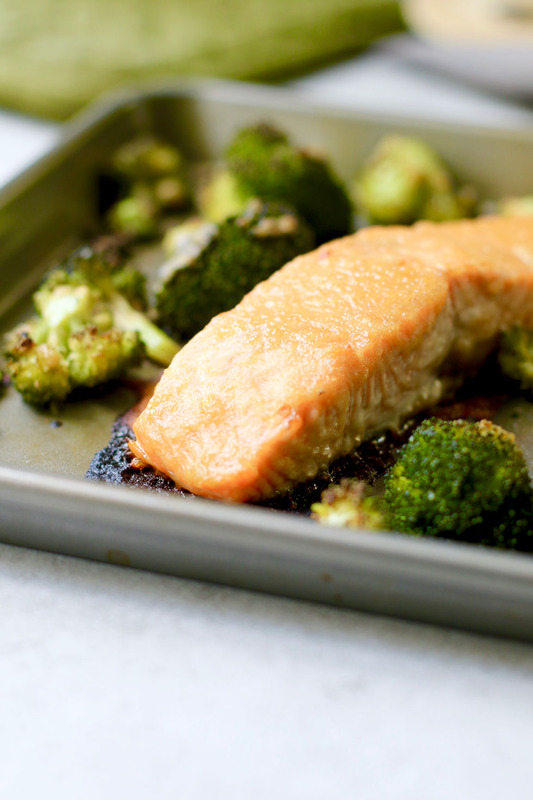 Sheet Pan Maple Miso Glazed Salmon & Broccoli is the perfect weeknight dinner recipe for two! Sheet pan dinners are one of my favorite ways to conquer the weeknight dinner dilemma. To take this from basic baked salmon, I did two things. One, I made this simple, slightly sweet but super savory maple miso glaze. And two, I broiled it! So let’s get right to it. I used white miso paste, fresh ginger, rice vinegar and maple syrup to make the maple miso glaze. You can also use red miso if that’s what you have in the fridge. Because the miso is high in sodium, you won’t need any added salt in the recipe. Whisk it all together and your prep is almost done. 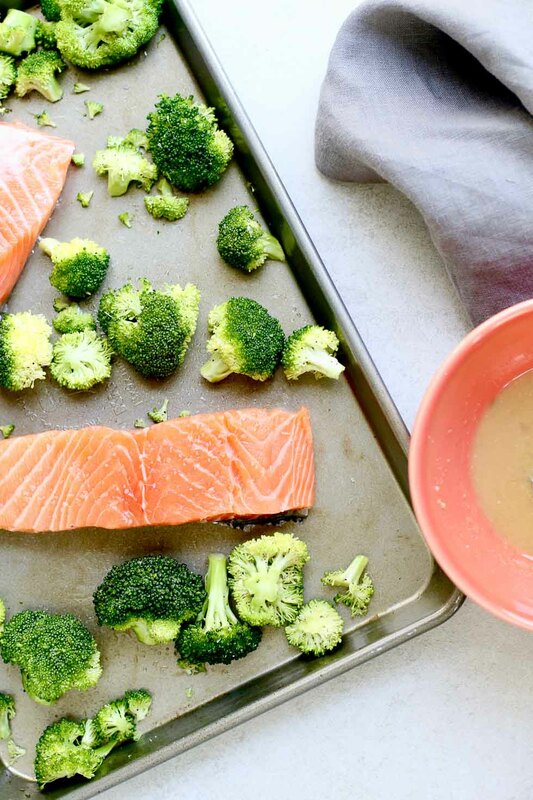 Spread the broccoli florets onto a sheet pan and toss with sesame oil, salt and pepper. 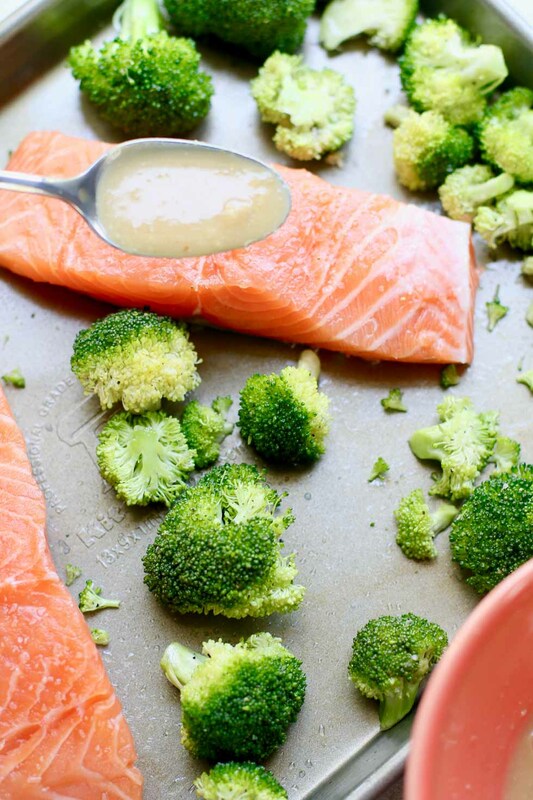 Spoon the glaze over the salmon. And pop that dinner into a preheated broiler. And… 7-8 minutes later, dinner is done! Note about the mess: Sheet pan dinners are super convenient but I always have this nagging voice telling me how much of a pain the pan will be to clean. Well. Not true. Get a good non-stick pan or use parchment paper. Though the burned on sauce looks like a mess, I gave my pan a quick soak and it all came right off. 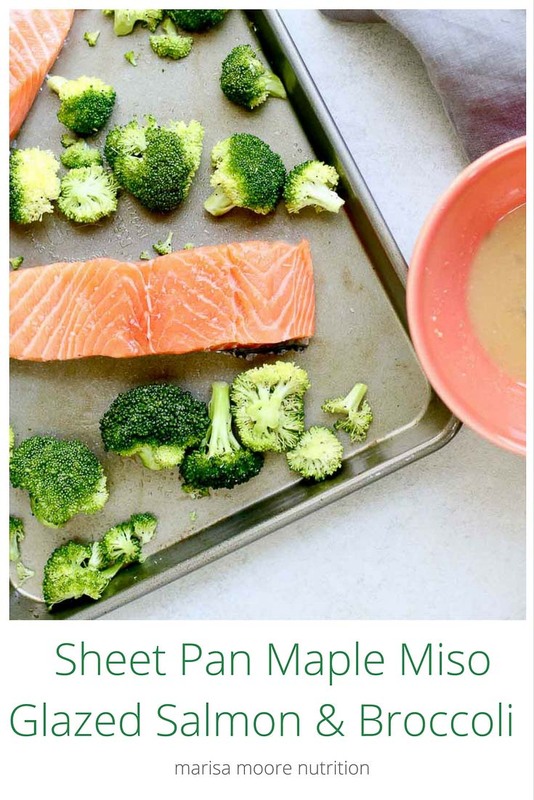 Be sure to scroll down and check out the Recipe Redux link for almost 100 new sheet pan dinner recipes! 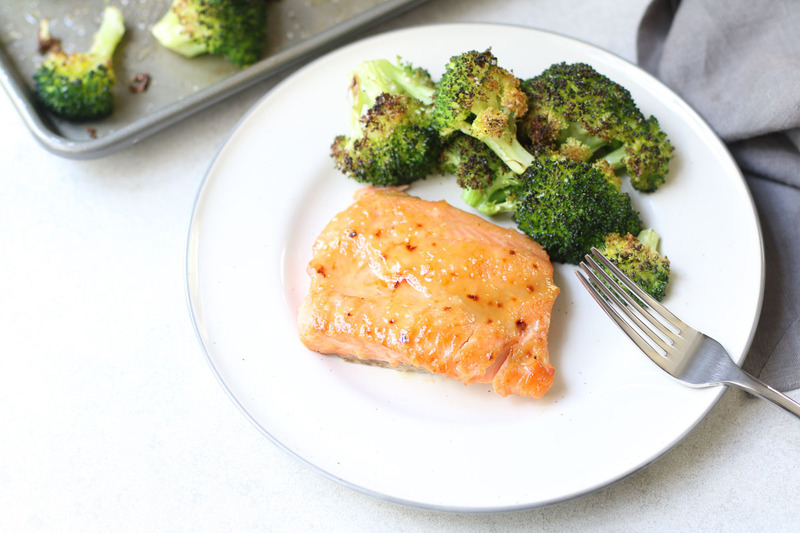 Here’s my quick and easy recipe for Maple Miso Glazed Salmon & Broccoli! Preheat the broiler - set on high. Slice salmon into two equal portions, pat dry, and set aside. 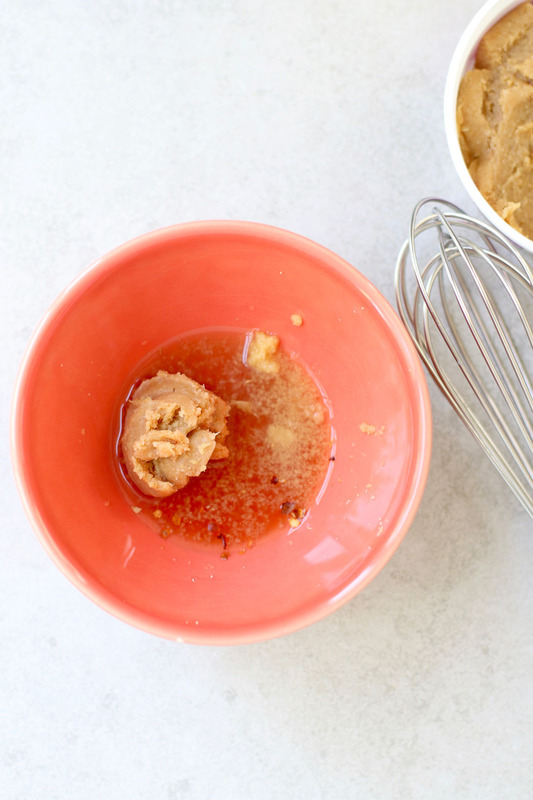 In a small bowl, whisk the miso paste, maple syrup, water, vinegar, ginger and optional red pepper flakes until smooth. 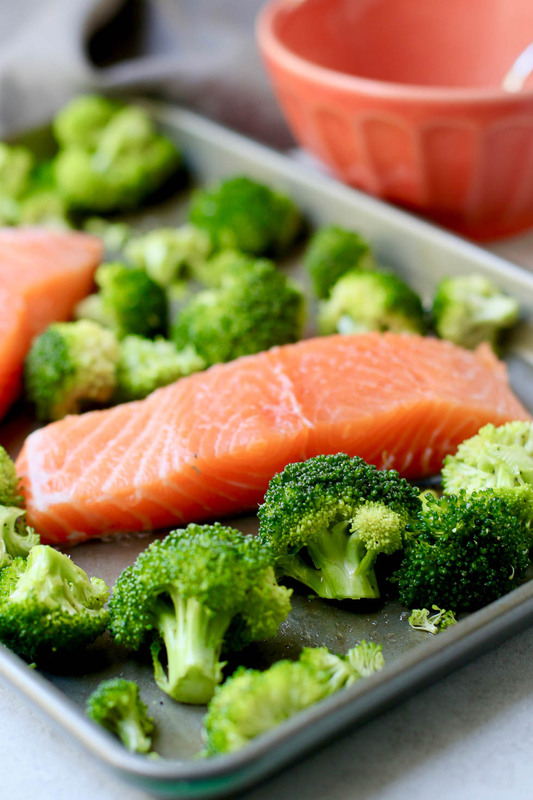 Spread broccoli onto a sheet pan in a single layer. Drizzle with sesame oil, and sprinkle with salt and pepper to taste. Toss to coat. Add salmon fillets. Spoon or brush the glaze on top of the fillets. Broil on high 7-8 minutes. Serve. What an amazing glaze! 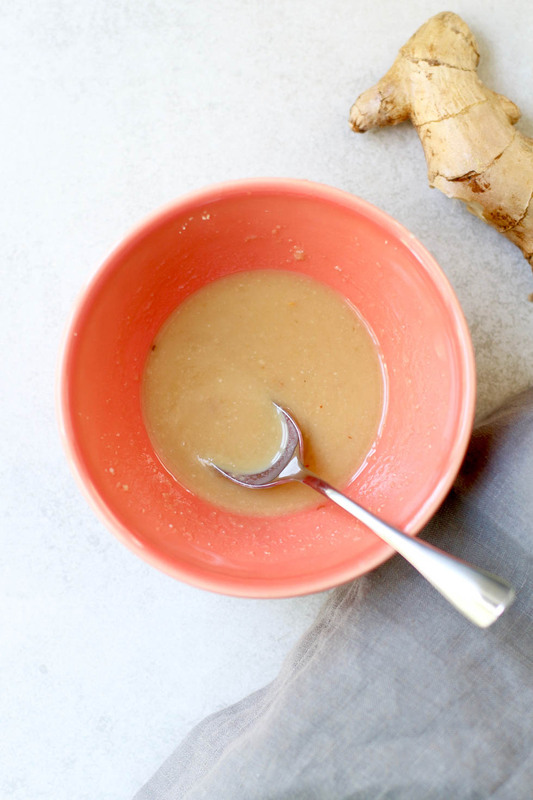 I love using ginger!